The Department of Communication Sciences and Disorders is proud to have Associate Professor Jean Sawyer as a member of their faculty. 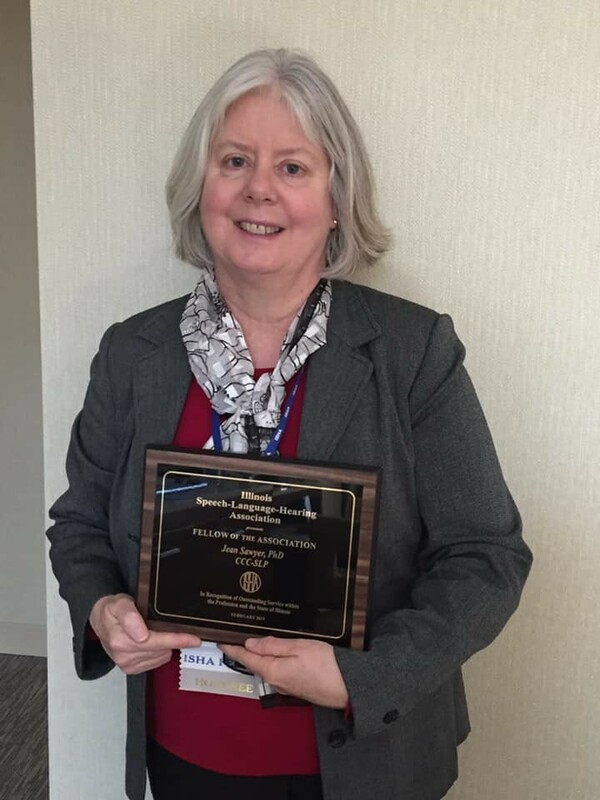 Sawyer was honored as an ISHA fellow at the Illinois Speech-Language Hearing Association (ISHA) Convention held in February. Sawyer was nominated by her peers for this well-deserved award due to her service as an ISHA convention fluency program track chair and her accomplishments over the years as a teacher and researcher. If you are a speech-language pathology graduate student in Illinois, it is likely that you have encountered Sawyer. In addition to her regular teaching load at Illinois State University, she has also taught graduate fluency classes at Northern Illinois University, Eastern Illinois University, and the University of Illinois. She might have had as many as a third of the graduate students in Illinois as students! Illinois State graduate student Salwa Khan has worked closely with Sawyer both as an undergraduate member of the National Stuttering Association (NSA) and now as Sawyer’s graduate assistant.